Canopy measurements in an undisturbed eastern Amazon forest (Cauxi, Para, Brazil. See Figure 1) were derived from a one-time event in 2000 using a hand-held laser range finder, and diameter at breast height (DBH) was determined manually. Parameters reported include: Crown Width, Crown Depth, Tree Height, and DBH. There is one comma-delimited ASCII data file with this data set. In addition, these manually derived measurements were compared to the IKONOS satellite data of crown dimensions that were acquired on 2 November 2000, from an orbital altitude of 680 km. The data from a 600 x 600 m block of undisturbed forest, including the 50 ha area surveyed in the field, were analyzed in a combined image processing and geographic information system environment. KNOWN PROBLEMS: Only the general location for this study was identified -- Cauaxi, Para, Brazil. The tree measurement data are of limited use because coordinates for the study site, coordinates of the beginning and end of the transects, and coordinates of the measured trees were not provided. Also, the area that the IKONOS image captured was not provided and the IKONOS image is not available due to restricted distribution. The investigator is Keller, Michael . You may contact Palace, Michael William ; Asner, Gregory P. (greg@globalecology.stanford.edu), and Keller, Michael. Canopy height and crown width in an undisturbed eastern Amazon forest (Cauaxi, Para, Brazil) were derived using a hand-held laser range finder. Trees were selected for crown geometry measurements using a stratified sampling scheme based on manual measurements of diameter at breast height (DBH=1.3 m) as the selection criteria. Crown location (understory, dominant, and superdominant) were recorded for all trees. missing values for canopy width are represented as -999; placeholders for missing values for other fields are not included. The data set covers the period 2000/06/10 to 2000/06/22. 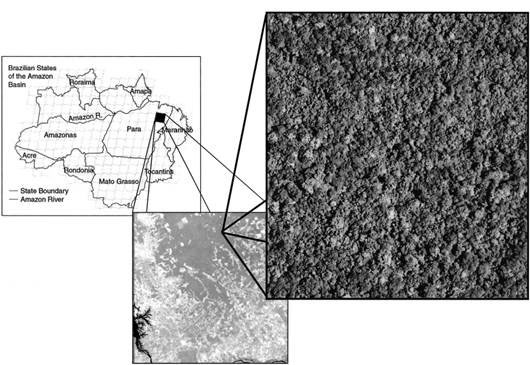 This project assessed the value of the field laser and IKONOS satellite data for measuring tree crown dimensions in a lowland tropical forest of the eastern Amazon, Brazil. A detailed field study of tree crown height, diameter, and depth using a handheld laser range finder and stratified sampling criteria based on the tree stem diameter at breast height (DBH) was carried out. Differences in crown shape between different tree size classes were also quantified. The field-based measurements of crown diameter and area were compared to estimates derived manually from panchromatic 0.8 m spatial resolution IKONOS satellite imagery. Median crown diameter derived from satellite observations was 78 percent greater than that derived from field-based laser measurements. The statistical distribution of crown diameters from IKONOS was biased toward larger trees, probably due to merging of smaller tree crowns, underestimation of understory trees, and overestimation of individual crown dimensions. The median crown area derived from IKONOS was 65 percent higher than the value modeled from field-based measurements. Investigators concluded that manual interpretation of IKONOS satellite data did not accurately estimate distributions of tree crown dimensions in a tall tropical forest of eastern Amazonia. Measurement data quality was good. Discussion of sampling and measurement comparability, representativeness, and accuracy are discussed in Asner et al. (2002). A forest site of ca 50 ha was selected for field and satellite measurements (Fig. 1). The most common upper canopy species found at the site were Manilkara huberii, Manilkara paraensis, Protium pernevatum, Dinizia excelsa, Piptadenia suaveolens, Licania spp., Astronium lecointei, Eschweilera odorata, and Parkia spp. Stand basal area was ca 57 m2/ha for trees greater than 10 cm DBH. Line transects of 500 m length were spaced at 50 m intervals crossing the study plot (N = 20). Fourteen of these transects were randomly selected for surveys of DBH, tree height, and crown dimensions. DBH measurements were collected for 2,171 individuals encountered with DBH > 20 cm (measured 1.3 m above ground or above buttresses) within 10 m to either side of each transect. For 300 selected trees, investigators collected additional crown dimension measurements including top-of-crown height, bottom-of crown height, and crown width along the estimated longest axis. Crown depth was estimated as the difference in tree height from the top to bottom of crown. These measurements were collected using a handheld laser range finder (Impulse-200LR, Laser Technology Inc., Englewood, Colorado), which measures distance and calculates heights via an angular measurement simultaneously taken from a clinometer integrated into the instrument. Asner, G., Palace, M., Keller, M., Pereira, M., Silva, J., and Zweede, J. (2002), Estimating Canopy Structure in an Amazon Forest from Laser Rangefinder and IKONOS Satellite Observations, Biotropica 34(4): 483-492.